Chicago: University of Chicago Press, 2014. 224 p. 120 color plates. $45.00. 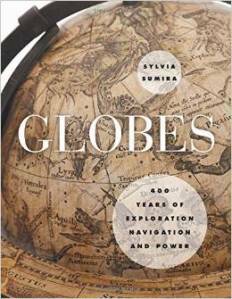 Sylvia Sumira’s Globes: 400 years of exploration, navigation, and power traces the evolution of globes from the sixteenth through the nineteenth century with a focus on their intellectual impact as well as their beauty. It is a welcome addition to an area of research where only a handful of books exist and few discuss the actual process of globe making. The immediate first impression a reader will have is of the beautiful, clean, and crisp images that fill the pages. Though the book offers a history lesson in globes, it is much like the author suggests; a brief history. You will want to take the time to look at this book and add it to your collection because of the over one hundred beautifully selected and composed color plates of various globes from the British Library. The photographs let the reader appreciate the totality of the globe from afar while also offering striking close-ups that invite you to spin them as you turn the pages. More interesting than the informative historical section of the book is an almost too brief section on globe making. Sumira specializes in the conservation of globes and this is evident as she expertly explains the intricacies of globe making and provides a foundation to better understand their significance as historical objects. With the current trend of maker spaces and 3D printing this section is sure to be of interest to a wide range of educators and librarians and the only thing missing was a DIY set of instructions for making your own globe! The rest of the book offers a glimpse into the world of sixty individual and carefully selected globes. An accompanying short paragraph highlights the unique process of how they were made and used. The variety and scope of the globes will stir the reader’s imagination and challenge them to rethink the role of technology in current mapmaking practices. One area of the book that could have been improved is a more dynamic and well laid out bibliography and glossary. Though it is thoughtful and serves as a great introduction to the literature and language of globes, I would have preferred an attempt to group the bibliography according to potential research areas and provide illustrative examples for some or maybe all of the glossary terms. This book is recommended for library collections that support critical and historical approaches to cartography, mapmaking, and geography – especially if there is a strong undergraduate population. Though the academic content is basic to intermediate in level it can certainly be appreciated by a wide range of users and anyone who has made a map recently in a digital environment will benefit from learning more about the process of globe making.